Microwave probably is one of the most used appliances at any home. However, it is one of the least cared and maintained appliance too. As a result, it starts presenting plenty of problems within a year or two of its purchase. You will be surprised to find how regular cleaning can improve the overall condition and performance of your microwave. Foods and liquids are regularly splattered all over the oven. Not only are this disgusting but can cause severely damage to certain components inside your microwave. The foods stains can easily be removed using oven cleaning products or simple soap and warm water. In case of a stubborn spot, fill cup of water and warm it inside the oven for 60 to 90 seconds. This will create some humidity and help loosen the grime for you to clean it out. You can prevent such spills by using covers, plates, paper towels or wax papers while the dishes are being heated. If you are unsure of something there is always your local appliance repair services to contact for any kinds of help! It is important to put items inside your microwave safely. There are plenty of objects that are not safe to be put inside an electric oven. Avoid putting metal or aluminium foils inside your oven as they run the risks of potential fires and explosions. 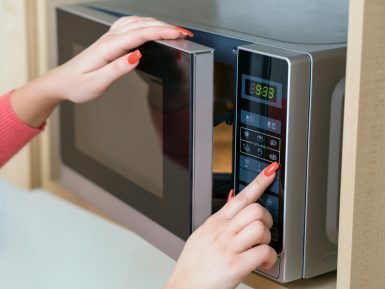 Dishware made of gold or silver accents should be avoided putting inside microwaves too. It is fine to use ceramic, glass and plastic items however, always look for items with the label microwave safe for safer use. Most of us do not usually use a pre-programmed cooking schedule to cook our meals in a microwave. However, in order to minimise energy losses this is one of the most efficient ways to do so. Try applying these presets and you will discover that the foods are getting prepared better. It will also help you prevent other troubles too. Every microwave has a weight limit. This is not usually a problem as majority of the foods and dishes fall way below the weight capacity. However, when you need to heat or cook larger frozen items or heavy dishes, it is best to check if they are exceeding the weight limit. If so then stop doing that otherwise you run the risk of damaging your oven. For which, you have to rush into your nearest appliance repair services for expensive repairing!